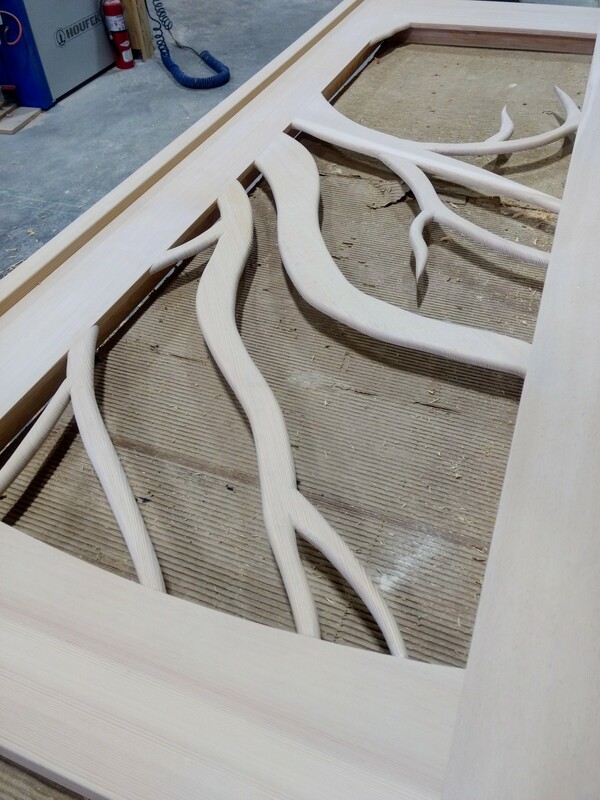 We're in the process of building a set of doors that have an artistic rendering of a tree on them in the form of mullions. Due to the obviously, er, branchy nature of the mullions it is not possible to do TDL on the glass unit. The glass unit is 1 1/4" thick, and some of the mullions are quite wide, as you can see, so you will be able to see the back side of the mullions when you look at the door closely. My question is what in your opinion is the best way to adhere the mullions to the glass? The doors will be installed in a variable climate area, however they will be protected under 12' of roof. There are mullions on both sides of the door, inside and out. My current thoughts on the matter are to do one of two things. First, I could fully cover the mullions in black silicone and then apply the glass, so that the silicone looks consistent from the back side. Removal of the glass unit should it ever be necessary would be very difficult and would likely result in damage to the mullions. Or, I could spray paint the backside of the mullions a glossy black paint, and then only apply a small bead of silicone to the edges. In the event of removal of the glass this would be much easier. I don't particularly find myself fond of either option. I'm giving this extra thought especially since we had an IGU fail on one of our doors recently. Luckily there were no mullions on that one. Any other methods to out there that I haven't thought of? I like the idea of finishing the branches first. Something like Gluvit would be good and then gluing to the glass with silicone. The hardest part is because you can see the backside. If the door is under 12' of roof I don't see why you would want to glue the "branches" to the glass. 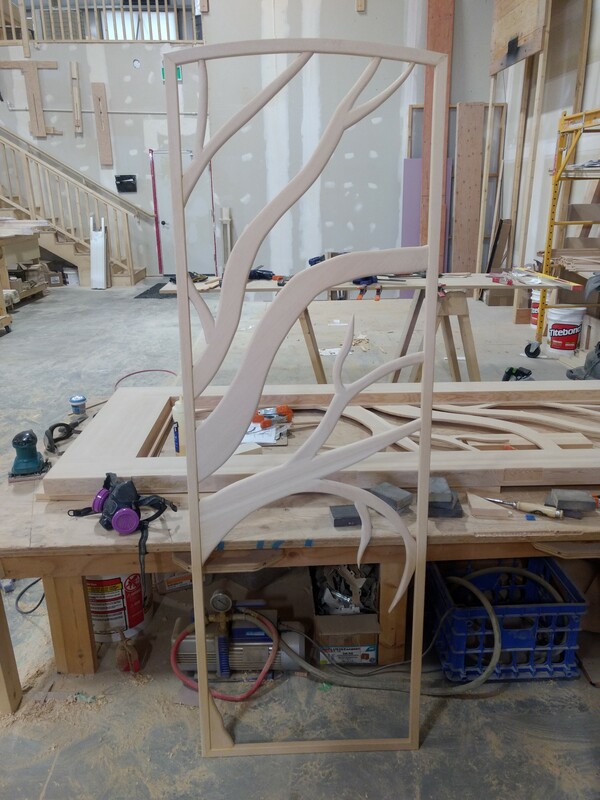 I'd finish the back sides of the "branches" the same as the show sides and install the glass like you would if there were no "branches". If you paint the inside surfaces black I think it's going to look poor because the glass unit is so thick. I'd make a mock-up to see which way to go. Silicone can often have air bubbles in it. The bond between silicone and glass is aggressive. There will be no fixing that door if the glass gets damaged. There are several polyurethane sealants(Sika) that provide waterproofing but do not glue themselves to glass. Most importantly. Why are sheet rocked walls always unpainted in woodworking shops? I guess we need it for fire proof resistance, but are too busy/lazy to prime them atleast. Nothing like a 20 year old unpainted taped sheet rocked wall. Its an acquired taste. The customer is going to be staining and maintaining the door themselves, so the option of pre-finishing the backsides the same as the rest of the door isn't there. They haven't even chosen the stain colour yet. Not particularly a fan of that, but that's what they wanted to pay. I would have made the entire panel of "branches" removable, screwed to the frame in a few places. Then it would be easy to remove, repair, refinish, as needed. If they are even just 1/2" thick they will be plenty rigid w/o gluing them to the glass. Can I ask why the glass units are 1 1/4" thick? Are they triple pane? If not this seems overkill. If they are just regular double pane glass units I would think you could get the glass maker to give you a mullion pattern between the panes. It would certainly be time consuming, expensive and take a talented hand to pull off. However the results would look like a TDL unit. I agree with the comment of attaching the branch mullion units at the edges instead of full gluing to the glass. If you are concerned about durability you could spot glue them in areas of concern with clear silicone. This is even better if you can pull of the curved between glass mull strips. The IGUs are 1 1/4" thick because the doors are 2 1/4" thick. The matching doors with solid panel construction have 1 1/4" sandwich style panels in them, so all the machining on the doors matches. Putting the mullions in the glass is certainly an interesting idea, and would make cleaning the glass units way easier, but that would require staining them first. Like I said, client hasn't even chosen stain as far as I'm aware. muntins divide the glass within a door or sash. And since your door- and a very nice door at that- will have a single glazing unit that's not divided at all, your proper terminology would be an integral grille. And I agree with finishing it both sides the same to weatherproof it and only glue the tips of the branches down to the glass with a good flexible adhesive. This door is more of an art object than door, so some terms/rules don't apply. J Burchard's book "Doormaking- A Do It Yourself Guide" has quite a few art doors in it, but he does not give the detail to them he shows with other types of more common doors. I can say that this art doors were huge in the 70's, but few have lasted, as more conventional assemblies have taken their place. All above is merely a preface to a hearty "good luck, Bub!" to you and your efforts. I would take the glass to 3/4" or even 5/8" (tempered - if no one has mentioned that yet), to limit seeing 'behind" the overlay. Stretch your moldings so they will match the other molds.